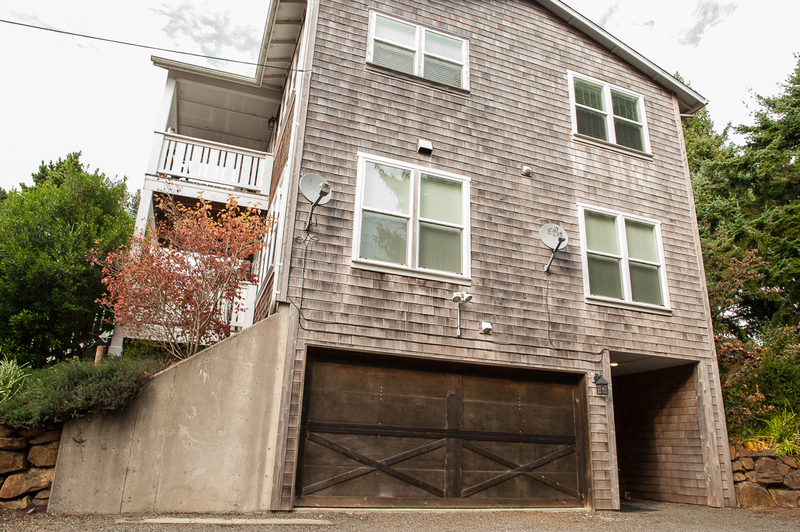 Pacific Star is a three level contemporary home located in the popular Road's End area of Lincoln City. 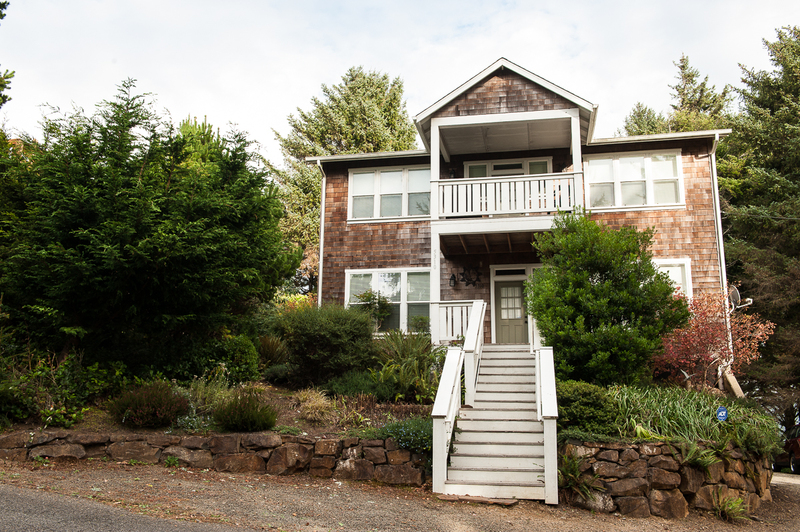 This vacation rental is conveniently located near the Chinook Winds Casino, plenty of shopping areas, tons of restaurants, and Road's End State Park. It features four bedrooms, four and a half baths, a fully equipped kitchen, a living room, a family room, a game room and sleeping accommodations for up to ten guests. Guests may choose from a California king bed, two queen beds, a single over a double bunk, and a folding cot. It is perfect for family vacations, small group get-togethers, and even business retreats. With distant ocean views, easy beach access within a ten minute walk, and plenty of space for everyone to spread out, this home will quickly become your favorite vacation spot. The garage has been converted into a game room with a pool and ping pong table and two foosball tables. Adjacent to the garage on the lower level is the family room with enough seating for everyone, a flat screen TV, an assortment of books, games and puzzles, and a full bathroom with tub and shower combination. Up the stairs, on the mid-level, are three bedrooms. The spacious master suite has a California king bed, a flat screen TV, a private bath with tub and shower combination, double sinks, and a walk-in closet. The folding twin cot can be found in this closet. A second bedroom features a queen bed while the third bedroom contains a single over double bunk. These two bedrooms share a central bath with a deep soaking tub. This level also has the laundry room with a washer and dryer for guest use. The top floor of this vacation home contains the main living area featuring a great room with a cathedral ceiling, a half bath and another master bedroom with a full bath. The comfortable living room area has plenty of seating to watch the large, flat screen TV or to gather around the cozy gas fireplace, great for those cool or stormy Oregon nights. A large dining table is available for your family dinners, with additional seating for four at the granite kitchen counter. The kitchen contains everything one needs to cook a delightful meal. Just off the great room is a covered deck with a plumbed-in natural gas barbeque with blue water views through the trees; perfect to use almost any time of the year. Outside, the yard is a welcoming oasis with mature and lush landscaping, big trees and an occasional deer passing through. A large deck awaits you with a picnic table to enjoy dining outdoors. The children will enjoy playing on the swing set or playing tag in the big backyard while the adults play a game of horseshoes. Enjoy the Oregon coast with your family at Pacific Star today! "Hello Kim, Thank you for your review. We are so happy to hear that you enjoyed your stay at Pacific Star! We hope that you'll come back again soon and vacation with us again on the Oregon coast! Thank you again for your review! " "It was amazing. I love the app and how easy everything was to set up and go through. I had such a great time at this time relaxing and playing games with my friends. " "Hello Carina, Thank you for your review. We are glad to see that you loved your stay at Pacific Star. Thank you for using our app during your stay. We are glad to see that it helped you! We hope to see you and your friends again soon on the Oregon coast! Thank you again for your review." "The house was clean inside but the outside could have used a power wash. There were cob webs and spider nests everywhere. The beds we're comfortable and the living space was perfect for our needs. Before the stay I had emailed with a question and never got a response. This proved telling as during our stay we could not figure out how to turn on the fireplace or outside light where the got tub is. We called the number and someone took our message but no one ever got back to us so for the entire 3 night stay we could not use the fireplace or outside light. There was no light switch that turned the light on though we could see there was one. The fireplace instructions detailed what to do if the pilot light was out, but it was on. No where was there a swicth or lever or anything else that started the fireplace. I would probably not stay here again because of the lack of service. " "Hello Joyce, Thank you for your review. We are sorry to hear that you did not enjoy your stay at Pacific Star. We aren't sure who you might have spoken to. It sounds like you might have called VRBO (who you booked through) instead of Oregon Beach Vacations which may be why no one ever got back to you regarding the issues you were experiencing. We do not have any record of a phone call in your reservation notes, so this may very well be the case. VRBO is simply a booking service we use but they are not able to help with any problems you may experience during your stay. Please call us directly for any issues you may have with your rental should you stay with us in the future. Thank you again for your review, and we hope to see you back again!" "This was one a nice house, plenty of space for everyone. We had lots to do. The rental had everything we needed to cook and eat together without having to go out to eat once. We had a pool tournament, a ping pong tournament and put together a puzzle. We didn't use any, but TVs on each floor. It was a little longer walk to the beach, so plan the route before you go. One warning, the kitchen and one of the master bedrooms are on the top story, so be ready to climb those flights of stairs over and over and over. It is a very short drive to any stores you may want to visit, but their wasn't a view of the ocean. " "Thank you for taking the time to leave us review! We are glad to hear you enjoyed yourself, and the home. Please come back and visit soon!" "House was very nice, we had a great time." "Kara, thank you for taking time to send in your review of your visit to Pacific Star. We are pleased to hear you enjoyed this lovely home. We do take reviews to heart and I have issued a service order to take a look at the oven door and have the middle floor bathroom door fixed so it will close tightly and securely. Hope wonderful memories were made to talk about with friends and family for years to come. When you are ready to visit the beautiful Oregon Coast once again please give Oregon Beach Vacations a call and it will be our pleasure to assist in making those plans." "We had such a great time staying in this home, with more than enough space for friends and family. " "Mr. Racette - thank you for taking time to send in your review. We enjoy hearing from our guest and knowing they enjoyed their trip to the beautiful Oregon Coast. For your next coastal getaway Oregon Beach Vacations would certainly enjoy assisting in finding another property to visit and add to the memories made on your last trip! Again, Mr. Racette thank you. " Pacific Star was a great home! "Pacific Star was a great home! We had enough space for the whole family!! It was very comfortable & it felt like being at home. It had just the right amount of everything. Thank You "
"Overall this was an excellent property with lots of room for the extended family to spread out. The steep stairs were a little difficult for the oldest members of our group. The location was a plus. We could walk to the beach or to the store. Two minor complaints are that the floors of the bedrooms were dusty and there was a broken chair in the main living area. Nonetheless, I would definitely recommend this property." "Hello Valerie, Thank you for your review. We are happy to hear that you enjoyed your stay at Pacific Star. We are sad to hear that it wasn't as easy for the older members of your family to navigate, but if you ever decide to stay with us again in the future, please give us a call and we can help you find better accommodations with less stairs if the same guests will be joining you. As for the floors and the broken chair, we are sorry to hear about this and would have gladly sent out a housekeeper to clean up for you and a maintenance worker to fix the chair. Our office staff is on call 24/7. We hope this doesn't deter you from staying with us again in the near future. Thank you again for your review, and we hope to see you again soon on the Oregon coast!" "Hello Pavel, Thank you for your review. We are happy to hear that the home had everything you needed and were hoping for. We hope to see you again soon on the Oregon coast! Thank you again for your review!" "Hello Tony, Thank you for your review. We are glad to hear that Pacific Star was everything you were hoping for! We can't wait to have you out again on the Oregon coast! Thank you again for your review!" "Wonderful property! Was clean and well stocked for 12 people! Thank you for sharing your beautiful home! " "Lots of stairs which was difficult for my disabled father. Because of the all wood floors, it was very noisy to anyone on the lower floors.There was 2 dishtowels and not dish clothes which made it difficult but other than that it was nice.Some of the furniture was broken but the yard was nice for the kids. " "Hello Kelly, Thank you for your review. We are glad to hear that you enjoyed your stay overall, but are sad to hear that you had some issues. We would have happily sent someone out to the property to provide extra towels for you, as well as tried to fix any broken furniture while on your stay. Please keep in mind that our office staff and maintenance is on call 24/7 and would gladly come out to solve any issues you were experiencing. We hope to see you again soon on the Oregon coast. Thank you again for your review." "Hello Jacquelyn, Thank you for your review. We are so happy to hear that you enjoyed your stay at Pacific Star and hope to have you stay with us again in the near future! Thank you again for your review!" "Two families rented the house to vacation together. The house was big enough for a large group. We found the house to be comfortable and spacious and well stocked with the necessary kitchen appliances and utensils. Some of the beds need replaced, the furniture in the living room also needs to be replaced. The recreation room (Garage) was fun, however it was very messy and the equipment is worn out. This house would be at the top of the scale for renting with just a few attentions to detail. The hot tub was very dirty when we got there, but they did send an employee to come clean it, but after you have got into a dirty hot tub, not many of us wanted to go back in. Attention to detail is the theme here, investing in a few better furnishings and recreation equipment would make this an outstanding rental. " Great beach house for the able body. "This house was Great..... it was well equipped to function in all aspects. The ONLY pitfall was there was a lot of stairs and the main level was on the 3rd floor. This presented a challenge for small children and older people. I will inquire about this home again. It was a great value." "Hello Aaron, Thank you for your review. We are pleased to hear that you enjoyed your stay at Pacific Star. We hope to have you stay with us again soon on the Oregon coast." "The house was clean and close to the casino. We could hear the beach. It doesnt have a crock pot so bring one for long stays. " "Hello Dionne, Thank you for your review. We are glad to hear that you enjoyed your stay at Pacific Star. We hope to have you back again soon." "Home was okay but the hot tub did not work the four nights we were there." "During our stay there were multiple issues with this property. I had to spend time on the phone both Saturday and Sunday in order to report the issues and have repairs made. The grill caught on fire due to built up grease from not being cleaned (not a simple little fire). The hot tub never worked properly (circuit popped and wouldn't reset). This has apparently been a known on going issue. The toilet handles were installed incorrectly and would fall out. There were two broken chairs. The batteries in the tv controllers need to be replaced and there were two light bulbs in the bathrooms that were burned out which meant showering in the dark. The outside garbage was completely full as well. This was not the nice relaxing beach property we expected. I was promised a hot tub refund by Katie and received a credit of $42.58. This amount is less than appropriate. We paid a good amount for this property. The fact there was a hot tub and a grill sold it for us. We were unable to use either. If proper maintenance was kept up on this property it would be a nice place to stay but that is not the case here. We paid more for this place because the fact it had a hot tub. A $42.58 refund for it not working is just a slap in the face. We won't be staying here again. "